Enough’s Raise Hope for Congo campaign kicked off a Facebook week of action yesterday to let companies know that their consumers want them to support strong implementation of the conflict minerals provision, Section 1502, of the Dodd-Frank Act. "Step Up for 1502" is intended to pressure the U.S. Chamber of Commerce and their member companies to back down from a legal challenge against the Securities and Exchange Commission, or SEC, over the legislation and implement the regulations with no additional delays or phase-ins. Section 1502 of the Dodd-Frank Act empowers the SEC to create rules and regulations that would require companies to disclose the origins of the minerals used in their products. If they use minerals from the Congo, companies must report the measures taken to exercise due diligence on the source and chain of custody of those minerals. The SEC, which was originally supposed to release the rules and regulations earlier this year, is finally set to release the rules for conflict mineral legislation in December. But just as multiple stakeholders, including industry groups affected by 1502, are making progress toward the systems that would lead to compliance with 1502 and toward a certification scheme that would help bring peace to the region, the chamber is prepared to delay the process once more. The chamber has indicated that it will bring yet another legal battle against the SEC. The chamber has already been successful in three recent challenges brought against the SEC and this time, it is working to water down or even overturn the1502 regulations. Another victory for the chamber would mean a great loss for the humanitarian cause to end the atrocities occurring daily in the Congo. This week, the Enough Project’s Congo campaign is calling on activists to raise their voices to prevent this challenge and support strong implementation of 1502. Each day, the Enough Project encourages activists to devote a few extra minutes on Facebook to send corporations and the chamber a message: Step Up for 1502 because we want our products conflict-free. Yesterday, Enough activists from around the country came together for a virtual sit-in on Dell’s Facebook wall, and today, consumers are asking Panasonic to step up. The week of action aims to give consumers a voice before the SEC holds a roundtable to discuss conflict mineral regulations On Tuesday, October 18, the SEC will be holding a live-streamed roundtable on the conflict minerals regulations, and Enough will be taking part. The roundtable is intended to provide a venue for all stakeholder groups to provide input and share views on the SEC’s rulemaking under 1502. Before the panel takes place, consumers can find a collective voice through Step Up for 1502 and remind corporations what is at stake if the chamber further delays SEC regulations: Conflict minerals will continue to fund militia groups that will prolong what has already been a bloody 17-year war. 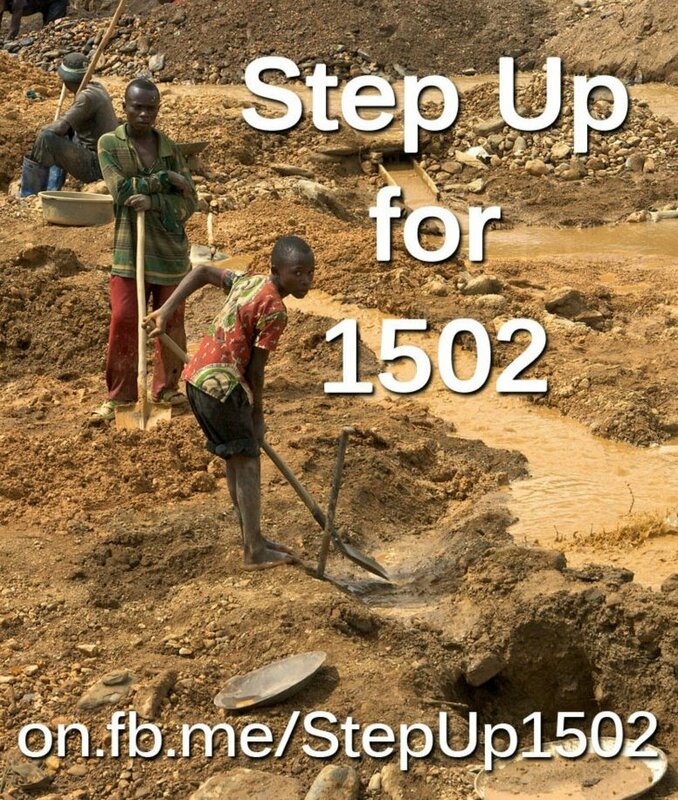 To learn more about the week of action and join our efforts, visit our Step Up for 1502 Facebook page. You can also sign up for emails announcing the day's target by joining Raise Hope for Congo.